The Calder Memorial Trophy is an annual award given "to the player selected as the most proficient in his first year of competition in the National Hockey League ." 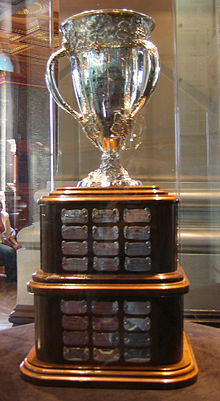 Serving as the NHL's Rookie of the Year award, this version of the trophy has been awarded since its creation for the 1936–37 NHL season. 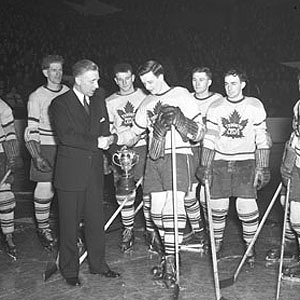 The voting is conducted by members of the Professional Hockey Writers' Association at the conclusion of each regular season to determine the winner. Colorado Avalanches Gabriel Landeskog wins the Calder Memorial Trophy for the 2011-2012 season at the 2012 NHL Awards. The guys discuss the potential Calder Trophy candidates and why Blues goaltender Jordan Binnington is their pick to win the trophy. The NHL tonight crew talks about Elias Pettersson's electrifying start to his rookie season making him the front-runner for the Calder Trophy. Carolina's Jeff Skinner wins the Calder Memorial Trophy as the rookie of the year for the 2010-11 NHL season. A look at the finalists for the player who was "most proficient in his first year of competition in the National Hockey League", or the leagues best rookie.